We should remember that the statements of those who witnessed the events of Jesus’ life, death, and resurrection are recorded posthumously for us in the historical record. There is absolutely no reason for any person to doubt the authenticity of the testimony which has been given to us concerning the events that are narrated in the text of the New Testament. For the past 2,000 years, no one has ever successfully impeached the testimony of the New Testament writers. There have been hundreds of attempts to impugn the single most significant event in the history of the world, but never a single successful impingement—due to the massive amount of evidence. The burden of proof to challenge the testimony recorded in the New Testament scriptures is on the opposing parties who make their claims that the text is not reliable. Dr. Simon Greenleaf, co-founder of the Harvard Law School, is considered one of the world’s great minds concerning the rules for the laws for evidence. His “Treatise on the Rules for Evidence that is admissible in our courts of Law” is still in use today, and is a valuable authority for what constitutes valid evidence. No critic to date has successfully impeached the four gospels in a manner that the majority of scholars would concur is reason to doubt their authenticity—or cause uncertainty that the accounts described in the New Testament narrative are anything but true and accurate testimony of the actual events which transpired in Jerusalem, concerning Jesus of Nazareth. The disciples of Jesus had committed to their memory, each of the important events which occurred during His brief three and one half year ministry—rehearsing these events over and over—retelling them to groups of people who would also memorize the events and teach others. The evidence that the early church considered these oral transmittals of the actual events surrounding the life, death, and resurrection of Jesus as scripture—equal to the Old Testament, is proven by the mass distribution of these letters to the churches in Asia by multiplied copies. Literary experts have examined the extant records of the New Testament and concluded that the copies which are in our possession today, surviving in such great number, fully substantiates the reliability of these texts. In other words, the copying of ancient manuscripts is a well-known fact in the courts of justice for the United States. It is also firmly established that these documents which have been copied by the early Christian church, are proven to be of substantial value and immense importance—by the shear number of copies which exist to the present day. According Dr. Greenleaf, the laws of evidence demand that all of these copies of the original documents would be received without hesitation as a valid transmittals of the true accounts of the events they describe, were they submitted to any court of law. The eyewitness accounts of the Gospels, preserved for us by thousands of copies of the New Testament, describe in great detail, historical events of such profound magnitude, that the course of the entire world has been altered. Certainly the firsthand accounts of Matthew’s gospel should be considered more reliable than the opinions of any scholar today. If the leaders of the early church considered the testimony of the four gospels as authentic, we should have no valid reason to conclude they are otherwise. Evidence in our possession today of papyrus from Matthew’s gospel, dated within 28 years of Jesus’ death and resurrection, is compelling confirmation that the resurrection took place precisely as Matthew described it in his narrative. (See Prophecy 245). Since the New Testament has been in global circulation for nearly 2,000 years, retained by the Christian church, and held as authentic by the leaders of the church—by time and preservation, the record of the New Testament must be considered authentic and reliable. The burden of proof to demonstrate facts to the contrary is on those who oppose and criticize these records, alleging that they are not authentic. Merely to state that the gospels are unreliable because they were written at some distance from their occurrence, or make assertions that the events in the gospels did not occur at all, is both disingenuous and unsupportable by any valid evidence. How is it that some scholars today consider their ability to determine the authenticity of the accounts written regarding Jesus’ life, death, and resurrection are more accurate or credible than the Christian church of the first century, who authenticated the facts of the gospels immediately after these events took place? One of the preeminent arguments for the reliability of the gospels is the presupposition that the copies that we have today were written at too great a distance from the events they describe. Papyrus exists today which countermands this statement of Dr. Ehrman by scientific evidence, authenticated by one of the world’s leading Epistemologists. Manuscript fragments of papyrus from the original gospel of Matthew, which were written while he was still alive, have been discovered and confirmed as either written or dictated by Matthew himself from approximately 60 A.D.
On December 24, 1994, the Times of London reported on the front page of their newspaper that a German Biblical Scholar had discovered what was believed to be the oldest extant fragment of the New Testament, ever found. This discovery, considered by many as the greatest discovery since the Dead Sea Scrolls in 1947, proves that the Gospel of Matthew that we have in our possession today was written by firsthand accounts of a person who witnessed the death and resurrection of Jesus Christ. The Papyrus was likely handled by some of the 500 eyewitnesses, that Paul describes in 1 Corinthians 15:6, who saw Jesus with their own eyes—alive and risen from the dead. The gospels that are recorded in the New Testament are certainly no more tendentious than any other ancient documents in their declaration of facts of history. It is ludicrous to insist that because the New Testament is a religious book, that it should not be taken seriously as an equally important historical document which contains facts of history. This was the very reason that the writers of the gospels and the Book of Acts set out to record these events. The resurrection was such an extraordinary wonder, the writers of the four gospels felt that the entire world should have a permanent record of what took place—preserved for all time. This papyrus is compelling evidence for the historical reliability of Matthew’s gospel—being written originally by Him, as a true account of the resurrection of Jesus Christ. The firsthand evidence of Matthew’s gospel must be taken as more reliable than speculations which critics make regarding hypothesis which cannot be proven conclusively. Since we have confirmation that the text in our possession today, which has Matthew’s autograph attached, was written by him within 28 years of Jesus’ death and Resurrection, our confidence in these statements must be high. In addition, the secular record is replete with physical evidence of Jesus’ death and resurrection. The original manuscripts of the New Testament were duplicated in such great numbers and distributed so widely by the local churches during the first century, we have some 24,000 copies of these genuine autographs in our possession today. In order for such a great number of copies to exist 2,000 years after the resurrection event, there must have been a valid and deeply revered original—which was disbursed from Jerusalem to the entire world by a massive and urgent distribution. This great number of extant copies of the gospel accounts is precisely what we would expect as valid evidence—if in fact an event as profound as the resurrection of Jesus Christ really occurred. Events of antiquity which are later found to be inaccurate or based on fraudulent reporting have traditionally fallen out of favor with historians and soon disappear from the factual record. The first documents which recorded the resurrection, were obviously considered valid representations of the true accounts of Jesus life and death, as evidenced by their vigilant preservation throughout the twenty centuries of church history. The disciples of the men who were present when Jesus was crucified and later saw Him alive over a period of 40 days, ensured that this testimony which was transmitted to them, was preserved in the documents which were subsequently placed into the New Testament. The veracity of these facts is observed by the congruity between the extant copies of these documents which are uniform in all the basic facts of Jesus death and resurrection. It is important to note that not one of the existing copies of the New Testament documents denies that Jesus was crucified and then rose from the dead three day later. Every one of the surviving copies of the New Testament which are in existence today agree with each other in all of the basic tenets of the Christian Faith. It is interesting in the reporting of facts concerning the New Testament that those who oppose the resurrection of Jesus Christ as unsupportable by history—make their assault on the scriptures through claims of error in the preserved copies of these documents. In reality, these claims are unsupportable by the facts and bear no degree of effect upon the reality that the New Testament is anything less than a reliable conveyance of the true accounts of Jesus Christ. The issues of error which are alleged in the New Testament copies, all concern spelling, punctuation, and less than 50 variants which are of any importance. Critics of the Bible often use the number, “200,000,” in describing how many variants there are in the existing copies of the New Testament. In fact, these critics are quite disingenuous in their statements as a single word which is misspelled in thousands of manuscripts—may be counted as thousands of variants, although only one word has been misspelled. Biblical Scholar Dr. Philip Schaff, in his book: “Greek Testament and the English Version,” noted that there are really only 400 variants out of the entire 24,000 copies of the New Testament that are in existence. Not one of these variants are of any significance, nor affect any major doctrine of the Christian faith. In other words, in the very limited variants of the text within the many thousands of copies of the New Testament which are in some dispute—the issues are predominately a question of spelling or punctuation. In just 50 cases, even the text that is in doubt does not change the basic tenets of the gospels which substantiate that Jesus Christ was observed by more than 500 eyewitnesses as risen from the dead, after having been crucified—His death being verified by the Roman government, the leaders of the Jews, and the disciples of Jesus. It is inconceivable that the narrative of Jesus’ life, death, and resurrection were contrived or misrepresented by the four gospels and then widely copied and distributed to all of the vast number of churches who received these written communications. If these accounts were not true at the time in which they were written, or if they were considered as inaccurate during the first canonization of the scriptures, shortly after the events were written, they would have been excluded by the early church leaders. This important fact must be restated: A first century scholar’s knowledge of authenticity is certainly greater than any scholar today. If the details of Jesus’ life and ministry were untrue, specifically that He had not risen from the dead, there is no doubt that history would be replete with a great number of impeaching documents that would refute the testimony of the witnesses who had written that they saw Jesus alive during a period of 40 days after His crucifixion. The testimony of Jesus’ Resurrection was received as credible and accurate by all of the churches in Asia, as well as those who canonized their testimony as scripture, beginning shortly after the first century. In fact, we do not find any credible refutations of the accounts of the gospels which originate during the first century of the Christian church. Were the believers of the first church so callouss and lacked such diligence that they allowed incorrect testimony, fundamental to the church, to be distributed without any action? It is impossible that the 24,000 copies of the New Testament we have in our possession today would have no documents in opposition to their authenticity, if they were found at the onset, to be untrue or lacking certifiable evidence of eyewitness testimony. If these first century New Testament claims of resurrection were in fact false or unreliable, they would have been refuted shortly after the time of their publication. We should remember that the men who testified to the truthfulness of the resurrection were willing to die in order to validate their claims. All of the Apostles except John were brutally executed—holding fast the firm conviction that they had seen Jesus alive with their own eyes—after He was crucified. The facts are: we do not have a single, credible, impeachable document, from the first century which describes the four gospel accounts of Jesus’ resurrection as erroneous or unreliable. As a matter of history, the early church fathers themselves wrote extensively, quoting many of the texts from these first copies, authoring several commentaries and instructions to the church—from these early texts. Polycarp and Papias were both disciples of the Apostle John, and had firsthand knowledge of John’s eyewitness account of Jesus’ death and resurrection. Clement attributes the authenticity of both the Old and New Testaments equally, giving as much credence to the spiritual authority of the gospel accounts of Jesus as he did to the entire Old Testament. Clement quotes from all four gospels, the book of Acts, 1 Corinthians, Philippians, Titus, Hebrews, 1 Peter, and James. Polycarp, who is described by Irenaeus as a disciple of John, had firsthand knowledge of John’s testimony of Jesus’ death and resurrection which are recorded in his gospel as well as the book of Revelation. Additionally, Polycarp quoted from Romans, 1 Corinthians, Galatians, Ephesians, Philippians, 1 Timothy, and 1 Peter, Matthew, 2 Corinthians, 2 Timothy, and 1 John, Luke, Acts, and 2 Thessalonians. Papias, who was a contemporary of Polycarp, also a disciple of John—authored five books entitled “Expositions of the Lord’s Sayings.” Papias endorsed Matthew, Mark, Luke, John, Acts, and Revelation. The testimony of first century Christian church leaders bears witness to the authenticity and reliability of all the New Testament documents we have today. These men possessed great knowledge of the events of the resurrection of Jesus Christ, living themselves in close proximity to the time when the disciples of Jesus had written in describing His resurrection from the dead. These men were in a position to either confirm or refute the gospel accounts. They affirmed these records and continued themselves to write commentary in support of the resurrection and the testimony of the Apostles who saw Jesus alive after He was crucified. What few people considered at the time Jesus was arrested, accused, and crucified was that all these events were a part of God’s prophetic plan for the salvation of man. Many of those who witnessed Jesus being crucified, or who had heard of His death— largely viewed Him as a failure. After news of Jesus’ resurrection spread throughout the world, thousands of people turned to Him for the forgiveness of their sins and the hope of eternal life. Had the resurrection not occurred, it is impossible that the Christian church would have grown so rapidly shortly after the first century. The important detail which set the Christian church apart from all other religions of the world is—their leader has risen from the dead. This was in fulfillment of at least eleven Hebrew prophecies that were written as far as one thousand years before the Resurrection took place—describing the Messiah rising from the dead on the third day (See The Resurrection of Jesus). We have in evidence today, the historical account of a massive explosion of the Christian church after the first century, due largely to the facts of the resurrection. If Jesus did not raise from the dead, it is unlikely that many would have followed Him or called Him the Messiah. The church of Jesus Christ became the largest teleological living organism in the history of the world because its leader accomplished something that has never been equalled—He rose from the dead. If the crucifixion was the final event which took place and Jesus simply died without being resurrected, the Christian church would never have become the greatest living testimony to the facts of His resurrection. Sociologist Rodney Stark, in his book “The Rise of Christianity,” describes the Christian church as growing by 40% in just the first century alone. This exponential expansion is largely attributable to the facts of Jesus’ resurrection being viewed as authentic—due to the testimony of eyewitnesses who documented these facts immediately after Jesus was raised from the dead. According to Peter Rogers, in 1 A.D., the population of the earth was about 200 million people. By 300 A.D., the population had grown to over 250 million. Rodney Clark wrote that the explosive growth of the Christian church, by 350 A.D., places the number of followers of Jesus Christ at over 33 million—or 56.5 percent of the total population of the world. In 250 A.D., the number of Christians was 1,171,356, which was just 1.9% of the population of the world. In 300 A.D., the number of Christians was 6,299,832, or 10.5 percent of the world’s population. By 350 A.D., the number of Christians had grown exponentially to 33,882,208, or 56.5 percent of the population of the world. If the resurrection did not take place as the four gospels describe, then how do we explain the explosive growth of the Christian church to over 33 million believers and 56 percent of the world’s population, just 300 years after the resurrection was first reported? If Jesus did not rise from the dead as He predicted, then He did not fulfill all of the Old Testament prophecies of the Messiah. In order for Jesus to be the true Messiah, He must raise Himself from the dead on the third day (Prophecy 319). If Jesus did not rise from the dead, we must ask ourselves why He was able to fulfill every other Old Testament prophecy of the Messiah, except the resurrection from the dead? Are we to accept that Jesus could raise Lazarus from the dead, heal the blind, open the ears of the deaf—all in direct fulfillment of the Hebrew scriptures concerning the Messiah, while stopping short in fulfilling the resurrection of the Messiah? The testimony of the four gospels is established by history as unimpeachable, though efforts have vigorously been made to impugn this evidence. The prophecies of the Messiah can only be fulfilled by One person who is capable of achieving the fulfillment of absolutely every part of the Hebrew Scriptures. We can demonstrate that Jesus of Nazareth did in fact accomplish every one of these predictions. This is the subject and principal goal of this book. Since secular historians, as well as New Testament scholars, have stipulated that the record of Tacitus in the Annals of Rome concerning Jesus of Nazareth—who was crucified under Pontius Pilate—is a settled fact of history, then this becomes a great springboard for also confirming the resurrection of Jesus. Men who are of such great diligence, honesty, and posses the historical integrity to report the true and accurate names of cities, people and governmental actions of that period of history—must also be men who have told us the truth about Jesus resurrection. All of the cities, people, and actions of the government of Rome during the period described by Luke’s gospel and the Book of Acts, have been verified by the world’s greatest and most proficient archeologists. Luke told the truth about every item he placed into his gospel of Jesus Christ—including the certainty that He rose from the dead. If Jesus did not raise Himself from the dead, then everything else that He said and did, including His repeated statements that He is the Son of God, equal to God, and the Son of Man—the fulfillment of Daniel’s prophecy of the coming Messiah—are lies, and we should pay no attention to Him. Without His resurrection, everything that Jesus said and did is a massive failure. There would be no point in recording the events of Jesus’ life if He had not done what He claimed—to raise Himself from the dead. Yes, of course He rose; for had He not, there would be nothing left to discuss. This is why every adversary of Jesus Christ comes against His resurrection—hard. If the resurrection can be disproven, then Jesus’ life is irrelevant. Jesus most certainly did raise from the dead, or none of the men who followed Him would have refused to recant the resurrection in the face of a horrific death. Nearly every man who said that Jesus had risen was given the opportunity to save his life, if he would only renounce publicly that Jesus had not risen from the dead. Would They Die For A Lie? The men who saw Jesus’ alive three days after He was crucified, were compelled to record, preserve, and give their lives in defending the certainty that they looked upon His living, physical body, alive after having watched Him die by such a brutal and horrific execution. Mark—dragged through the streets until dead. Luke—hanged on a large olive tree in Greece. John—According to Tertullian: John was placed in a boiling pot of oil but was unharmed, John was later banished to the isle of Patmos—where he wrote the book of Revelation. Peter—crucified upside down in Rome. James—beheaded in Jerusalem, with his accuser who turned to Christ. James the younger—beaten with a club and thrown off of a cliff. Phillip—scourged, thrown into prison, and crucified. Andrew—crucified, preaching to those in attendance until he died. Thomas—run through with a lance. Matthias—stoned at Jerusalem then beheaded. All of the Apostles who wrote that Jesus was alive three days after His crucifixion—died horrible deaths, defending their testimony as absolute truth. A man may contrive a story and stand by it until he is required to give his life for his testimony. No sane person would voluntarily die for a lie. Job records the fact that all that a man has, he will give to save his own flesh. The men, who witnessed what Jesus of Nazareth had said and done, safeguarded the accurate and worldwide distribution of their testimony—finally dying themselves for the affirmation that Jesus rose from the dead. There is no greater evidence for authenticity than when a man is willing to die for what he believes. All that a man has is his own life. To surrender that which is most valuable to defend a truth so vital, of such infinite importance, is all the testimony that we need to confirm that Jesus had, in fact, risen from the dead. Virtually everything we believe regarding past history is because of the eyewitness testimony of those who were there at the time the events they recorded, took place. How do we know that George Washington and Abraham Lincoln were actual persons of history? We read the testimony of those who saw them, heard them, and then recorded these events for us. The man Jesus Christ is a real person from history whose life has been recorded for us by the men who saw and heard the amazing things that He has said and done. There is more historical evidence for the birth, death, and resurrection of Jesus Christ than any other person in the chronology of the world. It has always been interesting to me that skeptics of the Resurrection of Jesus Christ refuse to accept the historical significance of the four gospels, because the testimony about Jesus being raised from the dead is from a religious document. Let us suppose for just a moment that a person had come into the world who claimed to be God in human flesh, and He actually said and did all of the things that Jesus is alleged to have said and done. Would we not expect that a few people would take special note of these extraordinary events and record them for all posterity? If you stood at the grave of a dear friend and witnessed a man call out to your friend to come back to life, and he did, would you keep this to yourself? If you were present when Jesus was brutally crucified and watched Him die—only to see Him alive with your own eyes, three days later, wouldn’t you want the whole world to know that this took place? Those who witnessed Jesus calling out to Lazarus when he came out of the tomb—those who saw Jesus alive after He was crucified—they were compelled to record what they had seen. The evidence that we have today as a result of these profound events, is precisely what we would expect if these things really happened. By the massive literary evidence alone, we are compelled to determine that the testimony concerning Jesus Christ is true. Experts tell us that one of the primary ways in which we can detect fraud, is by the internal structure of the testimony that is given. There are key indicators which allow us to detect the possibility of fraud. First, we can compare the words of the testimony that has been recorded, which describe certain people who are in governmental authorities, the cities which are mentioned, and the events which are purported to have taken place—with the historical and archeological record that exists. Archaeology has verified many of the secular governments, people, cities, and locations, which the New Testament writers describe. Second, if there are more than one account of a particular occurrence, we can check each testimony with the other accounts that have been written. One key indicator of fraud would be observed by the identical testimony of all the witnesses. If all of the stories describe the precise same points with no variance in details, this is a classic indicator of fraud. If, on the other hand, we find that each account is clearly speaking of the same person, while telling the story from a slightly different persecutive, this would be an indicator of a true account of the events these witnesses are reporting. The accounts of the four gospels, although they are each describing the same events of Jesus’ life, death, and resurrection, each describe these details in slightly different terms, adding certain details which are not found in the other gospel accounts. This appears to be by design, as each writer is clearly seeking to describe Jesus in the terms they wish to define. Matthew portrays Jesus as the King of the Jews; Mark, as the Servant of God who came to give His life for us. Luke being a physician, writes with the precision of a surgeon in describing the attributes of Jesus as a man—who is like us. John portrays Jesus as God, living within the body of a man, who has the power to raise us to life if we believe in Him. Finally, we would look for slight discrepancies that appear at first glance to be contradictory to other statements which are made in the details of the other witnesses. A true accounting by several witnesses will always have a few contradictory statements. This is due to the fact that we are dealing with human beings who each have their own particular view of a given situation, with a unique perspective. This is an area of criticism that is a consistent target for opponents of the Bible. Certain alleged discrepancies are viewed by those who do not believe in Jesus Christ, as evidence of fraud. In professional terms, from an evidentiary viewpoint in evaluating the four gospels—these slight discrepancies are a great reason to believe the four different accounts are authentic. Matthew mistakenly describes the prophecy of Zechariah, predicting that the betrayer of the Messiah would throw the thirty pieces of silver he is paid—into the house of the Lord—as spoken by the prophet Jeremiah. Critics view this error as evidence that the account is a fabrication. Experts in witness testimony view this oversight as clear evidence of authenticity. Zechariah 11:13b …And the LORD said to me, “Throw it to the potter”—that princely price they set on me. So I took the thirty pieces of silver and threw them into the house of the LORD for the potter. When a narrative is authentic, a speaker will, from time to time, describe events erroneously as originating from the wrong source. When Matthew was trying to remember where the prophecy was written, he was doing so from memory and mistakenly thought it was in Jeremiah’s writing. Very often as a pastor and Bible teacher, I will make this same mistake without realizing my error while I am teaching from the pulpit. I have often stated that a particular verse of scripture is located in a certain book of the Bible, when in fact the verse came from a completely different location. The text of the verse I am quoting was correct; I simply got the book wrong. As one who had made this mistake myself, I can certainly testify that it happens all the time. If my words were recorded—those who might read the transcript later, would notice that I incorrectly ascribed a verse of scripture to the wrong author. The separation of each scroll of the Old Testament—into individual books, did not take place until a point of history in great distance to Matthew’s gospel. At the time that the gospel of Matthew was recorded, the writings of Zechariah were included in the larger scroll of Jeremiah. Jeremiah, being the more important of the two prophets—Matthew simply quoted from the complete scroll of Jeremiah where Zechariah’s prophecy was located. The fact that we observe this occurring in the gospels gives us a great reason to believe that the New Testament scriptures are genuine. If a person were seeking to fabricate a lie and write a story to convince us, he would make sure that the details of his account were consistent with known sources. However, if a person was simply trying to recount the verse of scripture that he believed were fulfilled—much as I do when teaching on a Sunday morning before the congregation—he might misquote the wrong book. This tells us that the details which are written in Matthew 27:9 are a genuine account of what actually took place. This so-called “discrepancy” is not a valid reason to doubt the New Testament; in reality, it is a great reason to believe it. Another possibility is that this verse does not specifically state that the prophecy was written in the scroll of Jeremiah; it says that it was “spoken by Jeremiah the prophet…” Zechariah may have recorded the words of Jeremiah who had originally spoken them. When we investigate the New Testament in great detail, we find that the internal evidence which the writers have provided, gives us an abundance of clues to validate the authenticity of their narratives. The differences between Matthew and Peter’s account of Judas’ death, the mistaken quote of Matthew in describing Jeremiah as the source of Zechariah’s prophecy—all tell us that we have a true account of the events which they describe. We can have confidence that the life of Jesus Christ has been recorded for us truthfully by the actual people who saw and heard Him, witnessed His crucifixion and resurrection three days later, and testified that He is the fulfillment of all the Old Testament prophecies of the Messiah. The facts of Jesus’ scourging and crucifixion are intricately attested to by the four Gospels of the New Testament. The certainty that these events took place is firmly established in history as indisputable matters of fact. By the vast number of Old Testament prophecies, we have compelling evidence that the events of the Messiah’s scourging and His subsequent crucifixion, were well known and widely understood by the Old Testament scriptures. By the prophecies of Isaiah 53 and Psalm 22, we have 55 detailed predictions, comprising every possible aspect of the crucifixion of the Messiah (see Prophecy 242). When we arrive at the New Testament and discover that both the Bible and Secular history authenticate that Jesus of Nazareth was scourged and then crucified—in stunning fulfillment of the many Old Testament references—we have great confidence that Jesus is the Messiah who is described by these prophecies. Today, the world’s leading scholars agree that the crucifixion of Jesus is an established fact which is based on empirical evidence. As matters of history, the events of the scourging and crucifixion are described as ranking so high in certainty, that they are considered by experts as impossible to deny and the very basis for a foundation that Jesus of Nazareth lived, died, and rose from the dead—in confirmation of the the New Testament narrative. The reason that these facts are certain is that we have the corroboration of not only the Bible, but secular history. The orders of Pontius Pilate to have Jesus scourged and crucified are documented by one of the greatest Roman historians ever to write on this period, Tacitus. As early as the second century, Tacitus writes in his “Annals” of the Roman Empire, 116 A.D, (Annals 15,44) that under Caesar Nero, Pilate ordered the execution of Jesus of Nazareth by crucifixion. This record of Jesus’ execution by crucifixion under Pontius Pilate, written by Tacitus, is of immense value for the historicity of Jesus Christ. Being an independent source from both the Roman government and the Biblical text, Tacitus authenticates the narrative of the four gospels that Jesus was scourged and crucified exactly as the Gospels describe. Tacitus further describes the certainty that the Christians of this time believed that by drinking the blood and eating the body of Jesus of Nazareth, who was described as the “Christ”—those who believed could live forever. 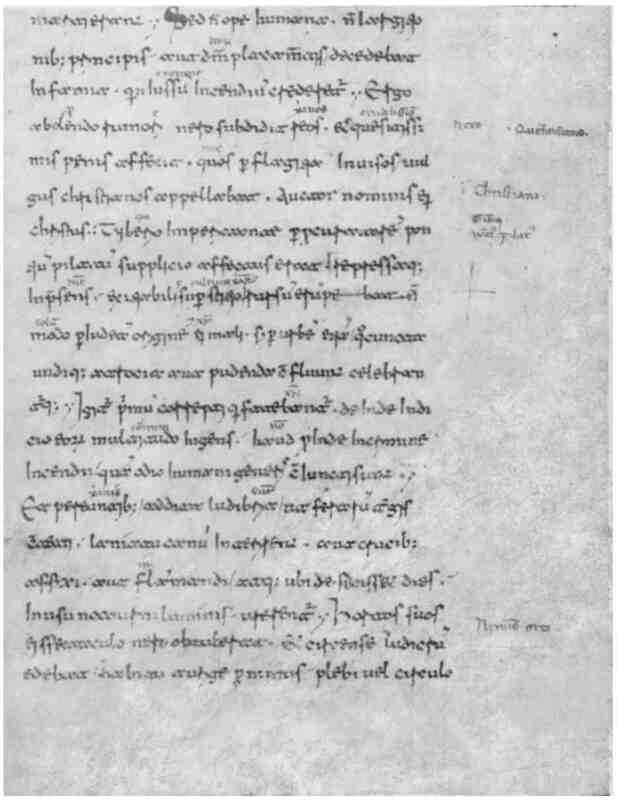 A copy of the Tacitus second Medicean manuscript of Annals, Book 15, chapter 44, the page with the reference to Christians. The most credible scholars today have confirmed that this text from Tacitus is authentic and reliable. Paul Rhodes Eddy and Gregory A. Boyd, in their masterpiece of critical assessment of the Gospels, describe the verity of the Tacitus text as firmly establishing, by extra-biblical sources, that Jesus was crucified under the Roman government—during the reign of Tiberius Caesar, by Pontius Pilate, precisely as the New Testament Gospels describe. Other Scholars which include Bruce Chilton, Craig Evans, Paul R. Eddy, and Gregory A. Boyd also agree with John Meier’s statement. At the present time, the world’s Christian historians have impeached both the works of Hochart and Wilson as invalid and lacking evidence to conclude that they are true. Today, every suggestion that the entire body of text in the Annals are either inaccurate or a forgery has been rejected by virtually all credible scholars. Academic experts confirm that the crucifixion of Jesus is an established event, equal to any other respected and confirmed event of antiquity. Even those who are regarded as scholars, who do not believe in the deity of Jesus Christ, consider Jesus’ scourging and crucifixion as actual occurrences that can be proven from extra-biblical authorities. About 93 A.D., Renowned Jewish historian Josephus wrote that Jesus was crucified under Pontius Pilate in the “Antiquities of the Jews,” 18.3. Josephus was born in 37 A.D. and died in 100 A.D. It is certain that he was aware of the writings of the Gospels which described the scourging, crucifixion, and resurrection of Jesus Christ. We know today that by recent discoveries of New Testament papyrus which have been dated from the period of time in which Matthew was still alive, that Matthew and Josephus were contemporaries. Although this text, referred to as “Testimonium Flavianum,” has been found in all of the writings of Josephus, there has been a massive attack regarding the authenticity of this section of the Josephus records. It is claimed by some that the text which describes Jesus alive three days after being crucified, is a Christian interpolation. Sidebar: Is it really a surprise that any secular record which authenticates the testimony of the four gospels in proving that Jesus rose from the dead, would be vigorously assaulted? Of course, the text of Josephus which confirms the resurrection of Jesus Christ—was inserted by the church after Josephus wrote his record of the Jews (tongue-in-cheek); for if it was not, the matter is settled—Jesus rose from the dead. The Sedition of the Jews against Pontius Pilate concerning Christ, and what befell paulina and the jews at Rome. One of the most important principles in following a good exegesis of literary sources is in examining the context before and after the statements which are in question. When the subject matter is the same before the questionable text, as well as after, as here in Josephus’ comments regarding Jesus’ Resurrection—we must conclude that the text in question is also valid; otherwise, we must exclude as an interpolation the entire text altogether. This is not possible since the whole text of chapter 3 (including the resurrection) has been part of every extant copy of the Antiquities of the Jews by Josephus. Scholars have stipulated that Jesus was crucified under Pontius Pilate, from the record of Josephus and Tacitus. Although the crucifixion and resurrection text are both a part of the same work by Josephus, only the resurrection is excluded as a Christian interpolation. Irregardless of the evidence that presented to support the resurrection, of which the New Testament is the best and most reliable source, no liberal scholar is ever going to concede the facts of the resurrection. The reasons for a critical rejection of the resurrection is self-evident—if the resurrection, is established as a firm fact of history, no person could ever intelligently refute Jesus or His claims upon all humanity. The existence of a secular record by a non-Christian—Jewish historian, who was also a Roman citizen, describing the followers of Jesus Christ, testifying that He had risen from the dead—is totally unacceptable to the opponents of God, His Christ, and His word. I have read every opposing opinion on the text of Josephus which claims that the Christian church added the section describing Jesus as risen from the dead. May I say—they are all lacking incontrovertible proof. At the present time, the evidence for the text being authentic is greater than the evidence against authenticity. Until such time that it can be proven conclusively that Josephus did not write the text which describes Jesus’ disciples declaring that He had appeared alive to them after three days—we must conclude that Josephus did write the text. The burden for proving otherwise rests on those who oppose the authenticity of the text. This “Testimonium” is found in every extant copy of this chapter of Josephus in the world today. As mentioned previously, Josephus and Matthew were contemporaries. Matthew wrote his gospel around 60 A.D. Josephus recorded his writings from 66 A.D through 94 A.D. It is likely that Josephus had personally read Matthew’s account of the resurrection and was a source for his own description of the followers of Jesus believing that He had risen from the dead. Josephus was a historian. He was born in Jerusalem around 37 A.D., and lived until approximately 100 A.D. He recorded events that took place during the same period of time when Matthew recorded his gospel of Jesus’ death and resurrection. During the interval which Josephus wrote “The Wars of the Jews” and the “Antiquities of the Jews,” Paul was also writing his letters to the seven churches in Asia, which were widely read by many Jews and Gentiles during the same period. It is probable that Josephus had read portions of Paul’s letters, as they were distributed over a wide area during the life of Josephus. Critics of this text from Josephus consistently report that the entire section describing the Resurrection of Jesus as a forgery, which was added by Eusebius. There is absolutely no evidence to confirm this allegation—except that no earlier copies of this text before Eusebius have be found. Simply because an earlier copy is absent from the record at the present time, we cannot prove conclusively on this basis alone, that Josephus did not write the resurrection text. Once again, all of the oldest copies of Josephus’ “Antiquities,” 18.3, contain the description of the Crucifixion and Resurrection. Andreas Köstenberger is the Senior Research Professor of New Testament and Biblical Theology at Southeastern Baptist Theological Seminary in Wake Forest, North Carolina (as of 2013). He writes in the book, “The Cradle, the Cross, and the Crown: An Introduction to the New Testament,” that there is very strong evidence that parts of the Testimonium are factual and authentic. When compared with the Greek and Arabic version, discovered in the 70’s by Shlomo Pines, they provide us with proof of the original text. According to Scholar Robert Eisler, for the first 1200 years of the Christian church, those who were in a position to know whether the Josephus Testimonium was authentic or not—considered the portion which contains a description of Jesus’ resurrection—as authentic and written by Josephus himself—affirmed this conclusion. Dr. Eisler has been described as “one of the most astonishing figures in the world of scholarship,” by his piers. From these facts we are left with the conclusion that the Testimonium of Josephus has been viewed as authentic and not a Christian interpolation by scholars who are in greater regard—superior to modern scholars today, who state that the Testimonium was not entirely written by Josephus. It is the opinion of this author, in researching the Testimonium, that since the most credible scholars of prior history have determined that the resurrection portion of Josephus Testimonium was written by Josephus—along with an equal history of the Christian church who also held this document as authentically written by Josephus, and no credible impeachment of these facts existing in evidence—other than conjecture—we must, today, conclude that Josephus wrote the entire text of this chapter, including the statement that the followers of Jesus had declared that He had risen from the dead. When Christians use the Bible to validate Jesus’ life, death, and resurrection, critics assert that these claims are not valid because they are Christian accounts of the events from their religious books. These assertions are not valid because Romans and Jews would not write these words in their descriptions of historical events. The text which is favorable to validate Jesus’ death and resurrection, were interpolated into the writings of these secular documents by Christians; therefore, they are not the writings of the secular authors. When Christian scholars insist that the New Testament accounts of Jesus’ death and resurrection are credible and accurate, skeptics claim that the copies of these narratives are not reliable because they were written at too great a distance from the events they describe. When secular scholars seek to validate non-Christian ancient literature from antiquity, they validate documents for these events that are many hundreds or thousands of years in distance from the events they describe. At the same time, secular documents which contain far less historical support than the Josephus Testimonium, are held as reliable accounts. There is a clear double standard that exists in scholarly criticism of ancient documents. We must remember that the resurrection was as much a part of the historical record of Jesus Christ as was His crucifixion. We have non-biblical confirmation that the crucifixion took place, in direct corroboration with the descriptions found in the four gospels. There being no testimony in the historical record that the Gospel accounts describing the resurrection were a hoax, it is reasonable as evidence in-fact, that both the crucifixion and the resurrection took place, just as the writers of the New Testament bore witness. What sets the Bible apart from all other books who claim divine authority is the actual confirmation of the words of the Bible by Archeology and the confirmed fulfillment of prophecy. If we can demonstrate that the ancient people and places, which are described in the Bible, actually existed—this provides great credibility for the authenticity of Old and New Testaments. Robert D. Wilson, Ph.D., February 4, 1856–October 11, 1930, was an American linguist and Biblical Scholar who was fluent in 45 ancient languages and dialects and had memorized the entire Old Testament in Hebrew. Dr. Wilson was able to recite, from memory, every word of the Hebrew scriptures without missing a syllable. Dr. Wilson demonstrated that the secular accounts of 29 ancient kings from 10 different nations were inaccurate. At the same time, He also firmly established that the names of these kings, as they are recorded in the Old Testament scriptures, matched the artifacts of Archeology empirically. Today, those who have criticized the Bible for being inaccurate have eaten their own words. The secular record has been proven inaccurate by discoveries of modern archeology, while the Biblical descriptions of archeological artifacts have been proven true. Previous claims that certain references in the Bible, such as the depiction of King David, Pontius Pilate, and the ancient Hittites—once claimed by critics of the Old Testament as myths, have been proven by archeological discoveries to be absolutely accurate. Today, no credible scholar disputes the accuracy of Biblical accounts of ancient cities, cultures, or people. They are beyond dispute and without impeachment. Nelson Glueck is considered one of the world’s greatest Archeologists. His work in the discovery of over 1,500 ancient sites led him to the firm conclusion that every reference in the Old Testament scriptures which refers to an ancient city, civilization, or people were entirely accurate in every regard. The evidence presented to us by the archeological record of ancient history demands a conclusion that the Bible is perfect in all its descriptions of the historical events it reports. Dr. Wilson describes the record of Biblical precision, which accurately describes names, cities, and events of history, as a marvel unequalled by any other literature of antiquity. Those who purport to be “experts” or scholarly authorities on the inaccuracies allegedly found in the Bible should go back to school and learn the important study of Paleography and the ancient languages in which the Bible was written. In regards to the New Testament and the facts that it reports to us in its narrative: Sir William Ramsey, world famous historian and renowned archeologist, describes the statements of the New Testament regarding the geographical and historical references it makes, as existing without a single error. Dr. Ramsey believed, at the onset, that the accounts which are described in the Gospel of Luke and the Book of Acts were inaccurate. Over 100 years ago, he undertook an expedition to Asia to try and refute the New Testament, only to become so overwhelmed by the evidence that he became a follower of Jesus Christ. Since Luke’s description of cities, names, places, and customs are perfect in their descriptive accuracy, it is certain that the accounts of Jesus’ life, death, and resurrection are also accurate and reliable. The fact that Luke has been confirmed as a scholarly historian of specific details regarding the history of the first century, it is certain that he also recorded for us, with the same precision, the specific events which transpired concerning the death and resurrection of Jesus Christ. Luke’s integrity as a historical scholar demands that we accept, with confidence, his testimony of Jesus’ resurrection, which is the foundation of the entire Christian church. One of the criticism’s of Luke’s account of Jesus’ life is found in his description of the census that he says was ordered by Caesar Agustus. Luke 2:1-3 And it came to pass in those days that a decree went out from Caesar Augustus that all the world should be registered. 2 This census first took place while Quirinius was governing Syria. 3 So all went to be registered, everyone to his own city. Because no archeological discovery had ever previously verified that such a census took place, Luke was regarded in past history as having embellished this story. A later discovery regarding the taxes of the kingdom of the Roman government revealed that the tax payers were enrolled every 14 years by the use of a census. Archeology has uncovered facts which verify that Caesar Agustus did conduct the precise census described, during the period of time Luke specified—near the birth of Jesus in Bethlehem. Further, an inscription discovered in Antioch describes Quirinius in 7 B.C., who was the governor of Syria, on two occasions—7 B.C. and 6 A.D.—a fact that is confirmed by the Jewish historian Josephus. In his book, Archeological Confirmation of the New Testament,” Dr. F. F. Bruce describes a problem that was present in Luke’s description of the Tetrarch of Abilene in Luke 3:1. Previously, there was no record of anyone called “Lysanius” as the tetrarch of Abilene during the time that Luke specified that he was there. In recent history, an archeological discovery made in Damascus, Syria, describes a person called “Freedman of Lysanias the Tetrarch.” Scholars date this inscription at between 14 A.D and 29 A.D. This is the same period of time in which Luke had written of Lysanias. An interesting discovery in 1910, by Sir William Ramsey, debunked the secular record of Cicero of the Romans who described Iconium as being in Lycaonia. Luke describes Lystra and Derbe as being in Lycaonia. Acts 14:6 they became aware of it and fled to Lystra and Derbe, cities of Lycaonia, and to the surrounding region. The secular record has been erroneously held as more reliable and accurate than the Biblical record in past history. This continues to be a common error that is made today. The facts bearing witness—the Bible is always right in matters of history and the secular record is consistently wrong. This truth has been confirmed by archeological discoveries over the entire course of human history—all over the world. Other noted scholars such as Dr. Adrian Nicholas Sherwin-White, a British historian and scholar—regarding Ancient Rome, wrote his doctoral thesis on the treatment of the New Testament from the point of view of Roman law and society. Dr. Sherwin-White examined the records of Rome and concluded that their own history proved the narrative of the New Testament scriptures regarding the death and resurrection of Jesus Christ. A substantial record from the Roman orator Julius Africanus and the Christian theologian Origen describes a Greek historian by the name of Phlegon, who described the three hours of darkness over Jerusalem during the time of Tiberius Caesar, when Jesus was crucified. According to this record, a Lunar eclipse took place during the Sabbath of that year. The Apostle Luke describes an event which sounds like a Solar Eclipse, which took place between 12-3 pm, on the day that Jesus was crucified. Luke 23:44 Now it was about the sixth hour, and there was darkness over all the earth until the ninth hour. Julius Africanus records that according to Roman historian Thallus, this darkness could not have been caused by a solar eclipse. The feast of Passover is always observed on the 14th day of Nissan, during a full moon. An eclipse can only occur when the moon is new and under the sun. It is astronomically impossible for a total eclipse of the sun to take place concurrent with a full moon. Tertullian, an early Christian church defender of the faith, described the darkness surrounding the crucifixion as occurring exactly at the time of day that Jesus was upon the cross. These secular accounts of phenomena which occurred during the time of Jesus crucifixion—add the the existing mountain of biblical text which states that darkness covered the earth during a period of three hours, when Jesus was bearing the sins of the world. In order to understand the facts of the Bible, a person must be much more than a scholar or an expert in ancient languages—he must be led by the Spirit of God. John 1:9-13 9 Jesus is the true light, who gives light (revelation of God) to everyone, was coming into the world. 10 Jesus came into the very world he created, but the world didn’t recognize him. 11 He came to his own people, and even they rejected him. 12 But to all who believed him and accepted him, he gave the right to become children of God. 13 They are reborn—not with a physical birth resulting from human passion or plan, but a birth that comes from God. According to John’s gospel, the Lord does not reveal the mysteries of the Bible to those who are not seeking Him. He reveals facts and great revelations of wisdom to those who have received Jesus as their Savior and are Born Again by the Spirit of God. The Lord calls people to serve Him who do not believe that they posses any power or ability of themselves. God calls the foolish, the weak, and the least likely—to know Him through the revelation of His word. This knowledge is only imparted to those who are His sons and daughters. A person becomes a part of the family of God by receiving Jesus Christ as their Savior and repenting of their sins. Those who humble themselves under the mighty hand of God are lifted to the heights of wisdom and knowledge. It is by the base, the simple, and the foolish that the Lord accomplishes His will. He has no use for the person who thinks highly of themselves. He cannot use anyone who believes that they are wise and have abilities that God could utilize. It is often a fact that the knowledgable and highly educated of this world cannot find God. He makes no sense to the world’s wise because their hypothesis of life does not include God, nor are they willing to submit their lives to Him. Therefore, He precludes these individuals from knowing Him. He has blinded the eyes of the learned so that they cannot find God. A truly wise man will also be a truly humble man, who acknowledges, recognizes, and honors God in all that he says and does. 1 Corinthians 1:27-29 But God has chosen the foolish things of the world to put to shame the wise, and God has chosen the weak things of the world to put to shame the things which are mighty; 28 and the base things of the world and the things which are despised God has chosen, and the things which are not, to bring to nothing the things that are, 29 that no flesh should glory in His presence. It is by a personal relationship with God and through a diligent searching of His word that a person becomes truly knowledgeable—with the wisdom to know how to exercise that knowledge. It is my sincere desire that this book might be a small help to all those who are searching for the truth, and that this truth might be found in God alone. The Preceding is the intellectual property of Robert Clifton Robinson, Copyright 2013, Filed with the Unites States Copyright Office, Washington, D.C.. No portion of this article may be copied, printed, stored, or used in any media without the permission of the author. 1. The Gospel of Matthew has been dated as being written by the Apostle Matthew Himself, within 28 years of the events he records. Dr. Carsten Peter Thiede, the director of the Institute of Basic Epistemological Research in Paderborn, Germany 2. Thiede, Carsten Peter & D’Ancona, Matthew, The Jesus Papyrus, Weidenfeld & Nicolson, London, 1996. Those scholars who attempt to discredit the resurrection, such as Dr. Bart Ehrman, do so from their assumption that Jesus did not raise from the dead and that many of the events of the Bible are a myth. Blomberg, Craig L. (2009-08-01). Jesus and the Gospels (Kindle Locations 2777-2781). B&H Publishing. Kindle Edition. Simon Greenleaf. The Testimony of the Evangelists: The Gospels Examined by the Rules of Evidence (Kindle Locations 125-133). Kindle Edition. Kellum, L. Scott; Köstenberger, Andreas J.; Quarles, Charles L (2009-08-01). The Cradle, the Cross, and the Crown (Kindle Locations 571-572). B&H Publishing. Kindle Edition. Kellum, L. Scott; Köstenberger, Andreas J.; Quarles, Charles L (2009-08-01). The Cradle, the Cross, and the Crown (Kindle Locations 575-579). B&H Publishing. Kindle Edition. Kellum, L. Scott; Köstenberger, Andreas J.; Quarles, Charles L (2009-08-01). The Cradle, the Cross, and the Crown (Kindle Locations 484-486). B&H Publishing. Kindle Edition. Thiede, Carsten Peter & D’Ancona, Matthew, The Jesus Papyrus, Weidenfeld & Nicolson, London, 1996. Eddy, Paul Rhodes; Boyd, Gregory A. (2007-08-01). Jesus Legend, The: A Case for the Historical Reliability of the Synoptic Jesus Tradition (p. 166). Baker Publishing Group. Kindle Edition. Acts 1:3 to whom He also presented Himself alive after His suffering by many infallible proofs, being seen by them during forty days and speaking of the things pertaining to the kingdom of God. Kellum, L. Scott; Köstenberger, Andreas J.; Quarles, Charles L (2009-08-01). The Cradle, the Cross, and the Crown (Kindle Locations .739-742 B&H Publishing. Kindle Edition. All refutations of the Resurrection came much later in the second and third centuries. 1. M. W. Holmes, The Apostolic Fathers, 3d ed. (Grand Rapids: Baker, 2007), 141: “This appears to be the earliest instance of a NT passage being quoted as scripture” (emphasis original). Holmes suggested that the passage quoted is either Matt 9: 13 or Mark 2 :17. 2.Kellum, L. Scott; Köstenberger, Andreas J.; Quarles, Charles L (2009-08-01). The Cradle, the Cross, and the Crown (Kindle Locations 1698-1700). B&H Publishing. Kindle Edition. 2.Kellum, L. Scott; Köstenberger, Andreas J.; Quarles, Charles L (2009-08-01). The Cradle, the Cross, and the Crown (Kindle Locations 1702-1704). B&H Publishing. Kindle Edition. The Letter of the Church of Rome to the Church of Corinth, Commonly Called Clement’s First Letter. Richardson, Cyril C. (2009-06-11). Early Christian Fathers – Enhanced Version (Kindle Locations 1029-1031). Christian Classics Ethereal Library. Kindle Edition. Eddy, Paul Rhodes; Boyd, Gregory A. (2007-08-01). Jesus Legend, The: A Case for the Historical Reliability of the Synoptic Jesus Tradition (Kindle Locations 3424-3428). Baker Publishing Group. Kindle Edition. Stark, Rodney (9 May 1997). The Rise of Christianity. HarperCollins. ISBN 978-0-06-067701-5. Peter P. Rogers, Kazi F. Jalal and John A. Boyd (2008). An Introduction To Sustainable Development. Earthscan. p.53. Stark, Rodney (9 May 1997). The Rise of Christianity. HarperCollins. ISBN 978-0-06-067701-5. page 6. The Rise of Christianity. HarperCollins. ISBN 978-0-06-067701-5. page 7 chart by Rodney Stark. John Meier, Marginal Jew, 1: 90; see also Evans, “Jesus in Non-Christian Sources,” 465. 2.Although a few scholars question the passage given that Tacitus was born 25 years after Jesus’ death, the majority of scholars consider it genuine. 9.John P. Meier wrote that there is no historical or archaeological evidence to support the argument that a scribe may have introduced the passage into the text. Meier, John P., A Marginal Jew: Rethinking the Historical Jesus, Doubleday: 1991. vol 1: p. 168-171. 2. Flavius Josephus, Whiston & Maier 1999, p. 662. According to the rules for evidence by Dr. Simon Greenleaf. The Jewish War (c. 75) and Antiquities of the Jews (c. 94). The Jewish War recounts the Jewish revolt against Roman occupation (66–70), Louis Feldman, Steve Mason (1999). Flavius Josephus. Brill Academic Publishers. Arabic summary, presumably of Antiquities 18.63. From Agapios’ Kitab al-‘Unwan (“Book of the Title,” 10th c.). See also James H. Charlesworth, Jesus Within Judaism, (http://ccat.sas.upenn.edu/~humm/Topics/JewishJesus/josephus.html). 1.S. Pines, An Arabic Version of the Testimonium Flavianum and Its Implications (Jerusalem: Academy of Sciences and Humanities, 1971), 16. 2.Kellum, L. Scott; Köstenberger, Andreas J.; Quarles, Charles L (2009-08-01). The Cradle, the Cross, and the Crown (Kindle Locations 4903-4904). B&H Publishing. Kindle Edition. Arabic version from the tenth century by Agapius, also know as Mahboub of Menbidj, a Syrian churchman and historian. Kostenberger, Andreas J.; Kellum, L. Scott; Quarles, Charles L. (2009). The Cradle, the Cross, and the Crown: An Introduction to the New Testament. ISBN 0-8054-4365-7. “The Messiah Jesus and John the Baptist according to Flavius Josephus recently rediscovered Capture of Jerusalem” and the other Jewish and Christian sources by Robert Eisler, Originally published in German in 1929, Translated by Alexander Haggerty Krappe (Methuen, 1931). 1. Gershom Scholem (Hebrew: גרשם שלום) (December 5, 1897 – February 21, 1982), was a German-born Israeli philosopher and historian. He is widely regarded as the founder of the modern, academic study of Kabbalah, becoming the first Professor of Jewish Mysticism at the Hebrew University of Jerusalem. 2. Walter Benjamin: The Story of a Friendship (English translation, 1982), p.131. 1.This includes all the Biblical and cognate languages, i.e., Hebrew, Aramaic, the Sumerian/Babylonian dialects, Phoenician, Assyrian, Ethiopic, the various Egyptian and Persian dialects. “A Scientific Investigation of the Old Testament,” by R. D. Wilson, “Is Higher Criticism Scholarly,” and “Which Bible,” by David Otis Fuller, who studied under Dr. Wilson at Princeton Theological Seminary. An interesting discovery in 1910 by Sir William Ramsey, debunked the secular record of Cicero of the Romans who described Iconium as being in Lycaonia. Luke describes Lystra and Derbe as being in Lycaonia. Acts 14:6 they became aware of it and fled to Lystra and Derbe, cities of Lycaonia, and to the surrounding region. Donaldson, Coxe (1888). The ante-Nicene fathers. 6. New York: The Christian Literature Publishing Co.. p. 136.